recognize my baby anywhere,” he says. 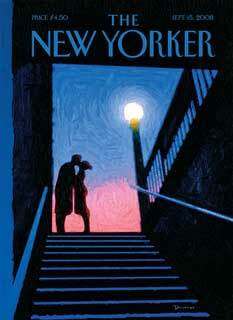 The New Yorker is famed for its artful covers and many people have them framed. The editors are silent on whether that particular cover was done with Snap Art, a plug-in program for Adobe Photoshop. But what if it was? Artists use whatever tools they can. This all comes up because of a new set of Photoshop plug-ins from Alien Skin (AlienSkin.com). The one that impressed us the most was “BlowUP 2,” which took even our tiniest pictures and was able to blow them up to eight by ten size or larger. Some of these blow-ups were nearly perfect, while others were restricted by the lack of definition in the original version. Blowing up a single head in a large crowd may not work perfectly. Nonetheless, the enlarged images were quite recognizable. If you start with an image that is high definition to begin with, like their example of a close-up shot of a lady-bug, BlowUP begins to show its true value for photographers and researchers. Blowing up a high definition photo by 300 percent revealed details that could not be seen in the original picture. In short, you got more information – much more in this case – than you thought you had in the original. This would be particularly useful for nature, medical and scientific photography. The best new feature is the crop tool. Joy dragged a box around her nephew’s face in a 4-by-6 prom photo. It looked great blown up as an 8 by 10. Other plug-ins in the new AlienSkin series are Image Doctor 2, and Exposure 2. The plug-ins work with Photoshop, Photoshop Elements or Corel Paint Shop, Mac and Windows versions. More info at AlienSkin.com.